It’s been a while since we have looked at single jackets, and it’s about time we do so. Today we will be taking a look at a popular jacket by a renowned brand. It’s the Nuptse jacket by The North Face. The North Face is one of the top brands when it comes to sportswear. It was established in 1968 in San Francisco, California, and for the past 50 years the brand has worked on developing eye-catching designs, as well as highly-functional ones for avid sports lovers and those looking to take their outdoor adventures to the next level. Unlike what we typically do in single reviews, where we look at either the men’s or women’s versions, today we will be including both of the versions and go through their specifics separately. Before we get started with the specific Nuptse jacket designs we have picked, we should mention that this jacket comes in various different styles. Thus the ones included in this review are not the only ones available. The jacket was originally designed in 1996 and has since been designed in multiple styles, colors and patterns, while still remaining as functional, high-performing and cozy as the original one. 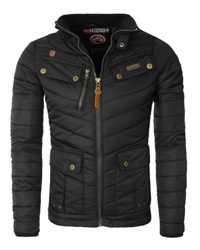 You can find this particular jacket style as a vest and not just as a heavy down jacket. Now let’s get started with what we have picked. 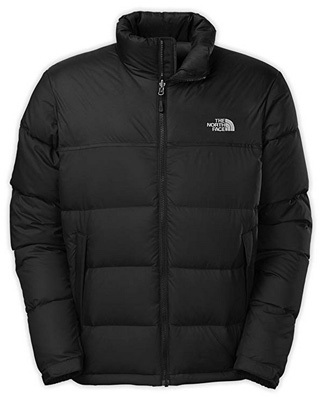 Where To Buy The Nuptse Men’s Jacket? 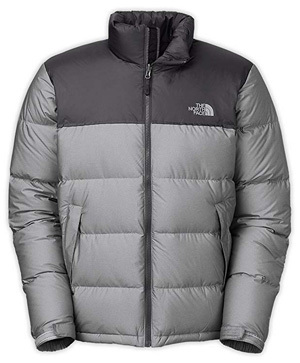 Nuptse is a down jacket, which comes in a versatile design in regards to looks. It is quite minimalist in style, without intense colors or flashy logos. For this reason, it can be worn as a casual jacket, as well as for work. Apart from its looks, Nuptse is a breathable and very well-insulated jacket, originally intended to be worn out on the trail when temperatures drop. Another design feature that makes this a practical jacket is its ability to pack into its own pocket, and it can be taken into the backpack or luggage without taking much space, and even used as a pillow when out camping. It is a hoodless jacket, with a high stand-up collar and a central VISLON® zipper, which helps keep moisture out. Its sleeve cuffs are adjustable with fastening tabs and there is also a cinch cord at the hem to completely close off the jacket from the elements. There are two hand pockets on the outside, with secure zipper closures that prevent moisture from getting inside, and there is also an internal chest pocket, which is where the jacket stows into for packing. Lastly, the jacket comes with internal compatibility zippers, which make it available to layer with other The North Face layer garments. Starting with the shell, it is made of 100% Nylon Ripstop fabric, which has been treated with DWR products to increase weather-resistance and protect the down insulation from getting wet. The lining is made of 100% Polyester, and the shoulders are double-layered with Nylon Taffeta fabric to increase durability to wear and tear. As we mentioned, this is an insulated jacket and it comes with an insulation of 700 fill power goose down, in a blend of 75% Down and 25% Feathers. For this reason, it is quite a warm winter jacket. The insulation is evenly distributed among the quilting and there are no blind spots to worry about with this jacket. 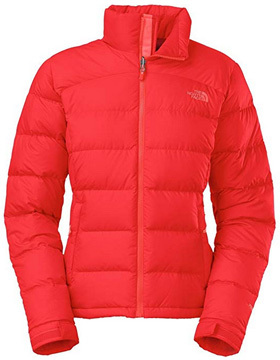 The down used by The North Face is certified as per the RDS by Control Union. Read also: The North Face Real vs Fake Jacket: How To Spot It? Despite there not being as many online reviews as we are used to seeing with other jackets, internet search results will give the same general consensus, which is that this is a very well-made jacket. Its quality is remarkable and its insulation and warmth are great for cold winter days. The packability is a great feature and its looks are exactly as the ones showcased in the pictures. The only thing to look out for is its sizing, which some reviewers recommend to go for one size larger. Where To Buy The Nuptse Women’s Jacket? 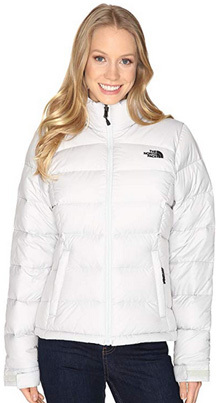 For women we chose the Nuptse 2 design, which is less bulky than the original one. 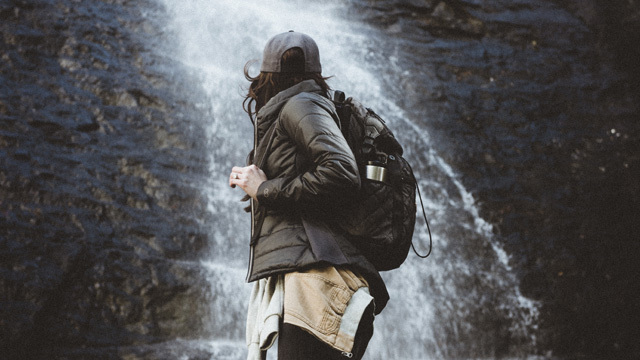 Staying true to the looks and purpose of the original Nuptse jacket, the Nuptse 2 is a minimal, elegant and versatile jacket that you can wear on your day to day ventures, as well as for outdoor activities. It comes with two outer pockets and inner chest pockets, as well as adjustable sleeve cuffs. There is no hood on this design, but its collar is padded and warm. The central zipper comes with an interior wind placket that prevents the cold and moisture from getting through. 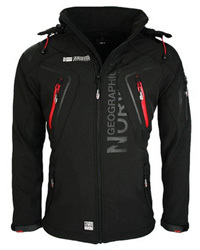 This jacket comes with zip-in compatibility for complementing layering garments by The North Face. Its hem is adjustable with a drawcord on the inside and its waist is slightly cinched for a more feminine look. The entire Nuptse jackets’ range is mainly made of Nylon Ripstop fabric and lined with 100% Polyester. Such is the case for the Nuptse 2 design for women. 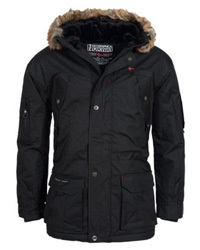 Its shoulders are double-layered with nylon taffeta panels and it comes with 700-fill power goose down insulation. Its fabric is highly durable to wear and tear and it also provides protection against the elements. The jacket in this image is not the one of this review. You might also like: Are The North Face Jackets Worth the Price? Why are they So Expensive? 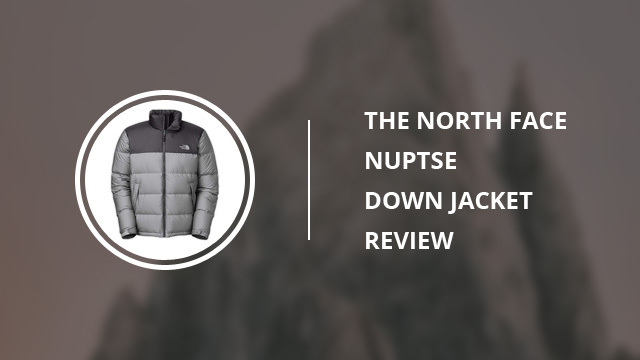 The Nuptse 2 jacket comes with very positive online reviews, which commend its high quality, longevity and stylish design. 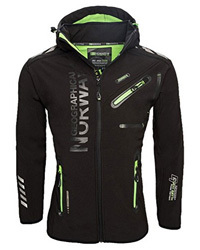 The insulation and warmth it provides are great for those living in very cold areas, and while the jacket is mildly weather-resistant, factoring in the lack of a hood, too, this is a design best suited for dry and cold conditions. There are no blind spots where the cold could seep in and the quilting and padding is well spread throughout the entire jacket, including the sleeves. The elegant silhouette is another good design quality for this jacket as it makes it able to better complement the outfit you are wearing. This is something that sets this jacket apart from most puffer down jackets out there, which usually are bulky and very puffy. While with the men’s version of the Nuptse jacket the thing to look out for was its size running a bit small often times, the opposite happens with the Nuptse 2 design. According to some online reviews, this jacket tends to run slightly larger, especially on the sleeves which are intentionally made to be roomy, as to allow for better movement. As you saw from both our descriptions and the feedback from online buyers, there is much to expect from this jacket and, fortunately, it does live up to its claims. Warm, elegant, minimalist and comfortable, it’s no wonder that The North Face had to expand its color and style range for this design, as its performance and quality are outstanding.